Alone of all re-enactment societies, Regia Anglorum owns a permanent site. 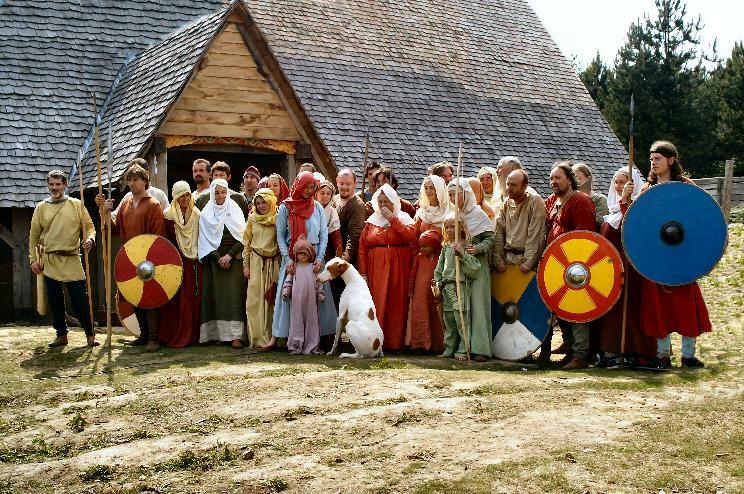 Situated about sixty miles from central London – in a patch of secluded woodland near Canterbury, in Kent – we have constructed a fortified manor house – a Longhall, if you will – built in the style of the Late Anglo-Saxon period. Here we are enjoying the fruits of our labours, posing with our Longhall on a lovely summer’s day. Our site is called Wychurst (pronounced "Wick-Hurst"). It was conceived, planned and constructed by our members – few of whom are professionals in the classic sense of the word. What you see is the result of many long hours of research, discussion, supposition and the practical application of skills with which our ancestors would have felt at home. Designed to create as authentic an atmosphere as possible to carry out our hobby, it was a way for us to, if but for a brief moment, to think to ourselves; “It must have been just like this”. Imagine, if you would, leaving your modern self behind at our gates. As you move forwards, you travel back through a millennium of history. Between the watchtowers of the burgh, you see our Longhall that dominates the tree-girt enclosure. As you approach, the sheer scale of the building takes your breath away. Ahead, within its walls, the sounds of feasting and lively conversation flow out from beneath its eaves. Pale smoke filters out from beneath the oak shingles. Off to one side, a wood store is occupied by a pair of disgruntled workers who have been given the chore of splitting wood for the longhall’s hearth-fire. Opposite, a forge rings out with the sound of heated metal being studiously hammered into shape by a diligent and antisocial smith. Tents are scattered here and there. Between them, there is hustle and bustle of activity as people rush to prepare their own offerings to this important occasion. This is the dream on which Wychurst was built. But it takes hard work and dedication to make it happen. If you would like to be a part of creating this dream, follow this link to find out about becoming part of it.